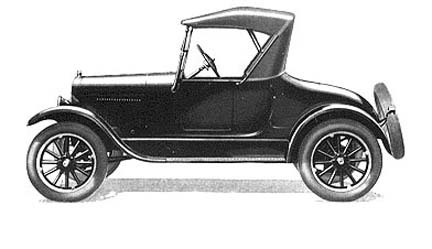 The Improved Fords for 1926. A Roadster-Pickup was in the line but is not illustrated here. Trucks continued in the 1925 style. # Price effective January 1, 1926. ## Price effective February 11, 1926. ### Price effective June 6, 1926. #### Price effective December 31, 1926 (unchanged from June). ** Includes starter and 21 demountable wheels. *** Chassis production figures are for U.S. and foreign, of all body types. See production charts for production figures of the various truck bodies. + Non-starter models not listed separately. ++ Early models with 30 x 3-1/2 non-demountable wheels and no starter. Available only on special order before calendar 1926. Starter is optional on the truck. Pickup body for Runabout, $25. NOTE: Starter and 21 demountable wheels were standard on all cars after early calendar 1926. Early 1926 cars with 30 by 3-1/2 demountables (then standard equipment) were 10 pounds lighter than the later cars. Wire wheels available beginning January 1926 in limited quantities as optional equipment, although they were announced in August 1925. ENGINE SERIAL NUMBERS: 12,990,077 to 14,619,254 calendar year. 12,218,729 to 14,049,029 approx. fiscal and model year (July 27, 1925 to July 31, 1926). MODEL YEAR DATES: August 1925 to August 1926. MAJOR MODEL YEAR FEATURES: All steel construction except for the Fordor Sedan. 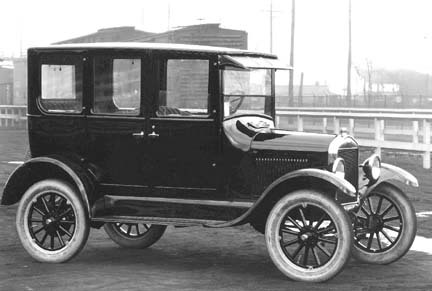 The Fordor was steel over wood frame, a modification of the 1925 body. Completely new styling; colors offered on closed cars although black seemed to continue in some production. Larger and heavier fenders and running boards. Touring and Runabout given doors on drivers side for the first time in U.S. production. New chassis frame with longer front and rear cross members. Larger rear wheel brakes. Engine/transmission modified with new pedals, a larger brake drum, different fan mount, coil box mounted on the engine, etc. Fuel tank now in the cowl except on the Fordor Sedan and truck. The trucks continued in the 1925 style. COLORS: All cars were painted black, with black fenders, initially. Closed cars were then offered in colors: green for the Tudor and Coupe, and Maroon for the Fordor. Other options offered later in 1926, perhaps for the 1927 models. UPHOLSTERY: Imitation leather in the open cars. The pattern was a stitched vertical pleat design on both seat bottoms and backs. Closed car upholstery was gray cloth with green stripe on the green cars (Coupe & Tudor), and gray with a red stripe on the maroon cars (Fordor sedans). FENDERS: All new and of much larger design, front and rear. The trucks continued the previous (1925) type. SPLASH APRON: All new, rectangular in cross section, now mated with the fenders and body to give the appearance of a more finished product. RUNNING BOARDS: Pressed steel with embossed diamond pattern but with much smaller diamonds the before. The Ford now appeared along the edges instead of in the center. Boards were much wider than the previous design. HOOD: All new to match the new bodies. CHASSIS: Similar to the 1925 but with new front and rear cross members to accommodate the new bodies and fenders. STEERING COLUMN ASSEMBLY: New design although quite similar to the 1925. The wheel is 17 outside diameter, made of Fordite (synthetic material), and painted black. The wheel spider is pressed steel and painted black. 5:1 gear ratio. The plating on the spark and throttle rods was changed from zinc to nickel during the year. Apparently the gear case remained polished zinc plated, but may have been nickel plated. FRONT AXLE: Same as the 1925 cars. Front spindles had the axle located higher on the spindle in order to lower the chassis a bit. REAR AXLE: Same as 1925 but with larger brakes. REAR RADIUS AND BRAKE RODS: Radius rods were of seamed construction, requiring a right and left side (the seam must face down to allow water to leak out). New design to accommodate the larger rear brakes. Brake rods were shorter than the previous type because of the larger brake backing plate and its cam location. WHEELS: Open cars used 30 by 3-1/2 tires all around. Non-electric open cars used non-demountable rims but all others used the demountables as standard. Before Calendar 1926, non-demountables were discontinued. Front wheels used taper-roller (Timken) bearings on all models. Hub caps have Ford in script letters. 21 demountable wheels standard on closed cars, and optional on the open models. Welded wire wheels were offered as an option, beginning about January 1926. Standard wire wheel color was black but colors were available. The hub caps for the wire wheels were entirely different, being crimped on to the wire wheel hub. The Ford logo and Made in USA was similar to the regular hub cap, however. RADIATOR: Same as 1925. Nickel shell offered as an option; became standard on the closed cars. Radiator valence had a nickel trim strip to match the nickel shell. ENGINE: Similar to 1925 but modified in many ways. Transmission cover now bolted to the rear of the cylinder. The water outlet served also to mount the fan. ENGINE CRANK: Same as 1923 one piece type with the rolled-in-place handle sleeve. ENGINE FAN: Now mounted on the water outlet and was adjusted by an eccentric arrangement. It had an aluminum pulley of different dimensions from the 1925 type. MANIFOLDS: The Manifolds for cars equipped with a standard carburetor were the same as in previous years. The Holley Vaporizer, however, made both manifolds integral with the carburetion system, and replaced the older manifolds. CARBURETORS: Kingston Model L4, Holley Model NH or Ford F. The Holley Vaporizer was used on many 1926 models. Carburetor adjustment was integral with choke and the adjustment needle now had a universal joint instead of the T fitting. CARBURETOR STOVE ASSEMBLY: Same as 1925. A stove was not used on Vaporizer-equipped cars. FUEL TANK: Mounted in the cowl on all cars except for the Fordor and truck. The Fordor continued the rectangular tank under the drivers seat; the truck used the oval tank under the seat. TRANSMISSION: Three-pedal standard-design. Pedals were of the plain type but the clutch and brake pedals are much wider. The brake drum was made wider, allowing more lining area. The cover was cast iron, but is somewhat wider to allow for the larger brake drum, and has integral ears for the bolts to the rear of the engine. The tapered inspection door, held with six screws, was the same as the previous pressed-steel type. Bands now had removable ears to allow changing without removing the transmission cover. COIL BOX ASSEMBLY: Redesigned and now mounted on the left side of the engine. Used the same coils as previously. LAMPS: Magneto powered electric type headlights on the non-starter cars, and six volt electric on the starter models. Nickel-plated rims. The headlamps were mounted on the fenders in early production, then on a tie bar between the fenders in later production. The tie bar evolved through several modifications in 1926. Earlier designs were just a connecting rod between the fender-mounted headlamps. After a few modifications of the tie-bar, the headlamps were finally mounted on the tie-bar itself, instead of on the fenders. Side and tail lamps were similar to 1924 on the non-starter cars. The oil tail lamp was turned sideways with a small red lens on the side (now the rear) and a large clear lens on the door to illuminate the license plate. Starter cars had a tail light which was mounted on the license plate bracket, the same as introduced in 1924, but mounted on the left rear fender. Tail lights on the factory-built pickups were mounted on a bracket below the pickup bed. Electric equipment became standard during 1926. HORN: Magneto powered electric on non-starter cars, but six volt on starter models. The horn mounting bracket was changed to allow the horn to be mounted on the water inlet, below the coil box. WINDSHIELD: Open cars similar to 1925 but with new stanchions. Both sections could be opened. The Coupe and Tudor had one-piece windshields which could be opened at the bottom (pushed forward). 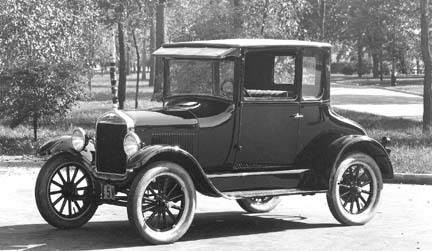 The Fordor continued the two-piece type used in 1925. TOP: (Open cars). Similar to 1925. Top socket had a slight curve at the bottom where it fastens to the body iron. SPEEDOMETER: Not standard equipment but a Stewart 490 was often seen. TURTLE DECK: (Runabout) Much larger than before, blending with the body yet still removable. It had no handles and used a larger key than the 1925 style. 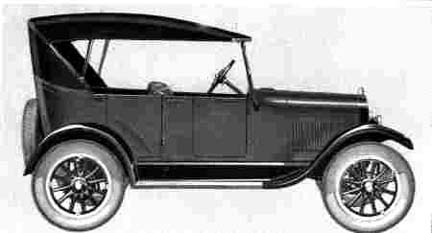 ACCESSORIES: Ford introduced a number of factory accessories for the 1926 (and 1927) models. Production dates were as follows: Bumpers, 1-28-26. Wire wheels, 1-20-26. Top boots and gypsy curtains for Tourings and Runabouts, 9-15-25. Stop light, 2-4-26. Windshield wings, 10-7-25. Automatic windshield wiper, 12-31-25. Snubbers (shock absorbers), 12-14-25.